In this chapter, we will describe the morphology of the right ventricular infundibulum, including the pulmonary root. On the specimen presented in Fig. 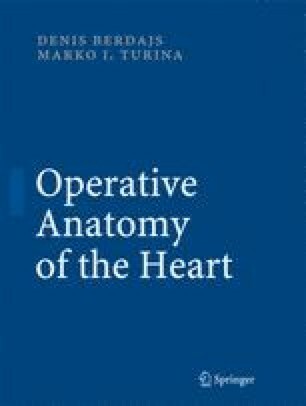 7.1, the human heart is examined from above and the left posterior view. The walls of the pulmonary and aortic roots have been removed down to the attachment of the leaflets; consequently, only the fibrous skeleton of both structures remains. The left and the right atria have been removed down to their annuli. The pericardial fat tissue and coronary vessels have been removed down to the ventricular musculature, and the mitral and tricuspid valves are open. Note that the right ventricle wraps around the left ventricle to such a degree that the ostium of the infundibulum is positioned at the level of the left ventricular ostium. However, the two ostia are not positioned in the same plane. The plane at the level of the nadirs of the semilunar leaflets in the pulmonary root may be taken as the reference plane; in the future, this will also be referred to as the pulmonary root base. This plane is shifted to the left and laterally relative to the left ventricle.